chestnut, 2008, City Zip-Miss Blue Grass, by St. Jovite. Fee: $2,000, live foal. Property of a partnership. GIG HARBOR standing his fourth year at stud. Is a debut winner and a multiple stakes winner of $143,300, who won the Oakland Stakes going wire-to-wire by two and a half lengths covering the six furlongs in 1:09! Won the eight and a half furlong Alcatraz Stakes wire-to-wire. 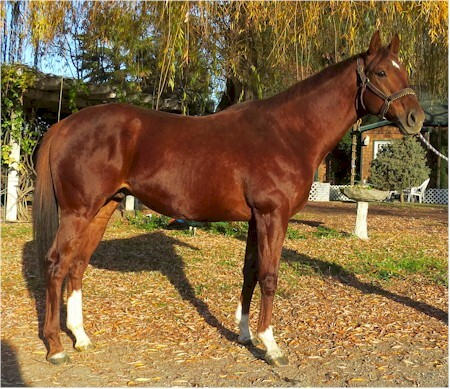 Only son of leading sire City Zip in California. sire of winners Kerri’s Choice (2 wins, 2 to 3, 2018, $54,285), Detangler (winner at 3, 2018, $46,051) and Perfect for Me (winner at 2, $22,915). General Comments: I wish he had run more than nine times. Granted, he was quite consistent and won two stakes, but one cannot help but think that had he been given a bit of time and shown how to relax that he would have won more money on the turf and been able to go farther. His broodmare sire, St. Jovite, won the Irish Derby and was out of Broodmare of the Year Northern Sunset, who produced four stakes winners, and three stakes placed horses including Salem Drive, Lac Ouimet, and L’Carriere. Plus his tail female line (Aloe) was nearly all grassy; the blood was there. Sire Line: Carson City, paternal grandsire of Gig Harbor, has always been one of the sounder sons of Mr. Prospector, owing no doubt to his very tough tail-female line (Hillbrook) – also the tail-female line of California sire General Meeting. Carson City – in addition to the still-active City Zip, is also the sire of Hear No Evil (sire of G1 SW Jackson Bend) and Pollard’s Vision (sire of $3M G1 stakes winner Blind Luck). City Zip has three listed sons at stud, all very early in their stud careers. Bustin Stones (standing in NY) is a G1 sprinter and is just getting started. He has a handful of winners including a stakes placed filly named Bit Bustin (out of a Cormorant mare). City Zip is inbred to Mr. Prospector and In Reality. Then there is Run Away and Hide who stands at Darby Dan near Lexington, Ky. and has sired over 6% stakes winners from his first foals, including G2 stakes winner Alberts Hope (Saint Ballado); Are You Kidding Me (G3, out of a Street Cry daughter); Mico Margarita (G3 out of a Mineshaft daughter) and three other stakes winners. Run Away and Hide is inbred to Blushing Groom. The only other City Zip listed at stud is Siente El Trueno whose first foals will be born this year and who stands in West Virginia. Clearly, Run Away and Hide has the best chance at this juncture to carry on the line due to his placement at a major Kentucky farm (Darby Dan). As I mentioned to you earlier, he tails to the immoral Aloe (Feola branch, the one developed by Queen Elizabeth II). This is an utterly epic family from Highclere and her kin to Round Table and his full sister Monarchy (she alone responsible for Johannesburg, Tale of the Cat, Pulpit and Minnardi to mention only a few). Gig Harbor’s 2nd dam, Daloma (FR) is a G3 winner and quite a nice racemare, having run out $322,042. She won stakes in Southern California and earlier placed in stakes in her native France. She has two major producing daughters, the winning Dalinda by Nureyev, dam of stakes placed Savonarola (GB), restricted stakes placed by Machiavellian and Dunloskin (GB), G2 placed by Selkirk. Gig Harbor’s dam, the winning Miss Blue Grass is her other stakes producer. In addition to him, there is also minor stakes winner Alonzo by Limehouse and stakes placed My Lil Shamrock, a full sister to Gig Harbor. She also foaled stakes producer Make an Offer by Officer, dam of restricted stakes placed Richies Sweetheart. Other black type winners from the immediate family include Daloma’s half sister Mouche (FR) by Fabulous Dancer, stakes placed in France and dam of stakes winners Mayoube (FR) by Kaldoun, winner of the G3 Laurel Dash in the U. S. and G3 placed in France; Tipperary All Star (FR) by Highest Honor (FR), a stakes winner and G3 placed who also won over hurdles. Tipperary All Star’s Full sister, Tipperary Honor (FR) was unplaced but is the dam of two stakes placed horses – Beauvoir (IRE) by Footstepsinthesand, 3rd in the G3 Prix la Force and Vaunoise (IRE), 3rd in the non-graded Prix Finlande. Gig Harbor is the product of a Phalaris/non-Phalaris cross. Broodmare sire St. Jovite is St. Simon line. Like most modern horses he has several crosses of Northern Dancer, two of the very stout (stamina) Wild Risk and of course his 2nd dam, Daloma, is inbred to Feola via Knight’s Daughter and Foretaste (his 5th dam). Sire City Zip is out of Broodmare of the Year Baby Zip, dam also of Ghostzapper, while the previously mentioned Northern Sunset (dam of St. Jovite and also a Broodmare of the Year) is from the family of *Rough Shod II (Sadler’s Wells, Nureyev, Apalachee, Topsider, etc.) Bellypha, sire of 2nd dam Daloma, is sire also of the great Linamix, one of the strongest branches of Lyphard and absolutely revered in Europe. I would not hesitate to double Blushing Groom, so mares with male (son) crosses of that fine fellow are a possibility. As Carson City is from the same line as General Meeting, this satisfies two family inbreeding crosses; Slew/Mr. P (X2 Myrtlewood and x2 Summertime Promise. I don’t know how many General Meeting mares might be left out there, but if you can find one or more ones of good family, it’s a nice cross. Ghostzapper is a bit young to have a ton of available daughters, but one might show up in a claiming race and be just the ticket for him, affecting inbreeding to Baby Zip. This is also the tail female line (Sailaway) of Kentucky Derby winner Lil E. Tee and a daughter of his would also be a nice match. Relaunch’s family is full of quality and has produced everything from Golden Act to the current sensation Tapit. Chimes Band and Rubiano are other sources. Mares carrying Habitony (by Habitat) would be nice, as his half brother, Northfields, is the broodmare sire of St. Jovite. St. Jovite’s Carpet Slipper family includes Sadler’s Wells, Nureyev, Apalachee, Topsider, Big Brown, Salem Drive, Lac Ouimet, Ginistrelli, Aragorn, King Pellinore, Atticus and many, many more. Any of their daughters or granddaughters would be acceptable. Flower Alley’s dam is inbred to Lyphard and Dumfries (x2 Goofed) and as previously mentioned, Bellypha is a fabulous force for good through his son Linamix, so if you should find a mare with Linamix blood that would work well, too. Gentlemen also stood in CA for a while and he is from Lyphard’s family as well. Baldric, Round Table’s 2000 Guineas winning son who appears in the 4th generation is bred very like Bicker who stood in CA. Iz A Saros had a line of him (Bicker) if there are any of his daughters left. Naturally, all those heavy-hitters from Round Table’s family like Monarchy’s kin Tale of the Cat, Pulpit, Minnardi, Johannesburg and others like Tell (who stood in CA), Fabled Monarch (also stood in CA), Sideral, Aureole, etc. all are viable. The horse has the pedigree of a king. Properly mated –and his get given some time, I think he might be one of the best stallions you have ever had on the farm. I really like him!